The Kips Bay Decorator Show House, designer list has been announced! The esteemed New York showhouse enters its 46th year, and will take place in a 36-foot-wide townhouse at 110 East 76th Street. Spanning seven floors and 15,000 square feet, 21 designers will have plenty of space to transform by May 1st. The race is on for these designers to translate their vision into reality in a lightning fast timeframe. The indefatigable, inspirational Bunny William will serve as chair again this year, and proceeds benefit the Kips Bay Boys and Girls Club and its youth programs. Congratulations to this year's participating designers, listed below, a nice mix of new talent tapped to do their first Kips Bay room, along with some returning designers. I cannot wait to see the magical transformation that takes place come May. This past May, the interior design world took to the design district in West Hollywood, Los Angeles to celebrate all things design at the annual event, LCDQ Legends of La Cienega. Frequently referred to as "summer camp for interior designers," it is a gathering like no other. Filled with inspiring lectures, launches, book signings and cocktail parties, these gatherings provide inspiration to last the whole year long. It was an honor and a thrill to be selected again this year to represent the event as a Blogger Ambassador, and champion the festivities. Every year, the selected designers construct over 60 unbelievably creative window vignettes around a theme. This year, Your True Colors was the guiding premise, which brought out the most original, daring and creative sides of the participants. Passersby convene on this stretch of La Cienega, the Design Quarter, to ooh and ahh over the theatrical and imaginative transformations while they are up to enjoy. The best time to take in the scene is illuminated under the cover of darkness, when the details can best be appreciated. Ahead, the standout windows that brought the Hollywood theatrics to life. Austin-based interior designer Meredith Ellis and James Showroom owner (who was once based in LA) turned one of Hollyhock's windows into The Explorer's Journal. She used an amazing backdrop of Jennifer Shorto's mural wallpaper. Dallas-based Michelle Nussbaumer subscribes to the more is more theory of design, and I love it. She created this tented fantasy with Quadrile prints in the window of Dragonette. Designing a Hijabdashery in Harbinger's window, New York-based design duo Tilton Fenwick made a welcoming statement with a give-back component. They had 7 Hijabs made of colorful prints and displayed them to represent the original countries in the Muslim ban. For every social media post with hashtag #hijabdashery, they made a donation to benefit a refugee center. Linear rainbow stripes with matching monochromatic leather-upholstered side chairs extended across the window of Nick Olsen's design for Harbinger. It was mesmerizingly bright and graphic. Go bold or go home, right Nick? 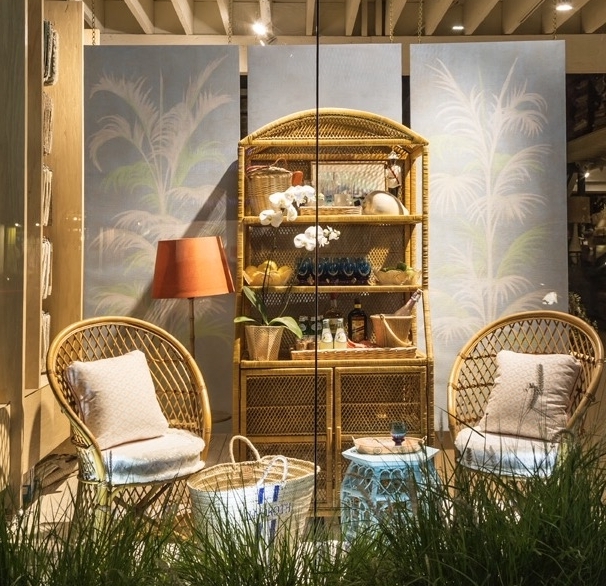 Capturing island style, Amanda Lindroth designed a window in Marc Phillips filled with wicker and woven accents. Just the spot to relax with a Gin and Tonic. Eclectic and energized, fashion designer Libertine's Johnson Hardig took his Hollywood at Home window to the next level with color, pattern and flair. Playing with one pattern, covering everything in it, the Charleston designer Angie Hranowsky that I finally got to meet in person, showed the power of prints in Reborn Antiques. And how cool are these white wicker pieces she found? Retro a go-go! Studio Tim Campbell brought personality and spare perfection to his Waterworks vest-pocket of a window, showing less can be more. A few Soane pieces is all you need. Thrilled to see LA based Parrish Chilcoat of recently launched Cameron Design takeover both windows at Elizabeth Eakins. Venetian plastered walls, a printed headboard and seating area grounded by a purple linen sofa with great art make this window move-in ready. Another great idea: Dragonette's design supported Habitat for Humanity with Color My World by Doug and Gene Meyer. A who's who of designers participated, and over $25,000 was raised for the charity. Well done! There is no doubt art inspires each and every designer in some way. Here, Andrew Brown, a new traditional designer from Birmingham set teh stage with art suspended against a vibrant red fabric backdrop. Andrew, we will meet, if not this year in LA, then next year in LA! A blanket of Claremont velvets patchworked together by Nickey Kehoe, Todd Nickey and Amy Kehoe, cool cats of the LA scene, had a handcrafted graphic element to it. A suspended mirror added an enigmatic quality. LA-based designer Kim Alexandriuk incorporated cool elements and ages in her Christopher Farr window, where she also got to showcase her new rug design. Hello from High Point! Lots of great new pieces and designer collection launches to see, and I thought I would provide a sneak peek of the new Jeffrey Bilhuber furniture and accessories collection with Henredon. It was inspiring and elegant, rooted in classic design history. A decorator known for his unique color combinations and attention to the pretty details, this collection has many unexpected moments of special finishes and high design details. Bringing years of interior design experience to the table, he has a distinctly American point of view, as you will see here. Follow along @stylebeatblog on Instagram to see more High Point Market favorites. One of my favorite classic pretty moments, this metal canopy bed and chippy white nightstands with upholstered walls and sunburst mirror reads traditional at its very best. The Moravian star, a favorite of Albert Hadley, was created in two sizes by Bilhuber for his accessory collection with Maitland Smith. I want 10 of them! They add dimension and interest to a coffee table like a sculpture would.